TOP CHEFS. 3 COURSES. ONE NIGHT TO REMEMBER. This event started in 2015 with the vision to raise a little money and have fun, but it has grown into raising over $100,000- each year more successful than the last. 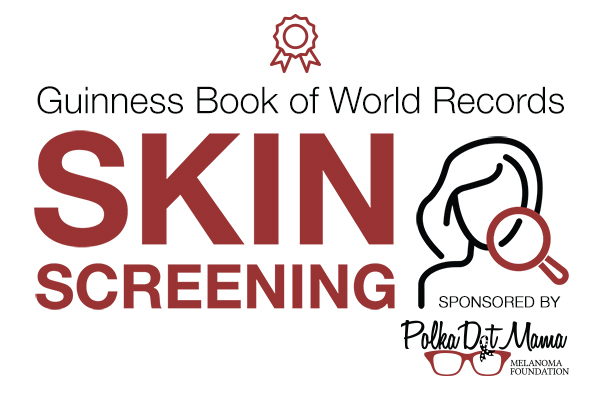 The money raised supports melanoma research for students, programs which include free skin cancer screenings, prevention, awareness events, and educational sessions-both online and in person. The 2019 Gala is shaping up to be the most amazing one yet! In case you have not heard, the keynote speaker will be the current US Surgeon General, Jerome Adams, MD., who has been personally impacted by melanoma. Also joining us will be Dr. Betsey Tilson State Health Director and the Chief Medical Officer for the N.C. Department of Health and Human Services. 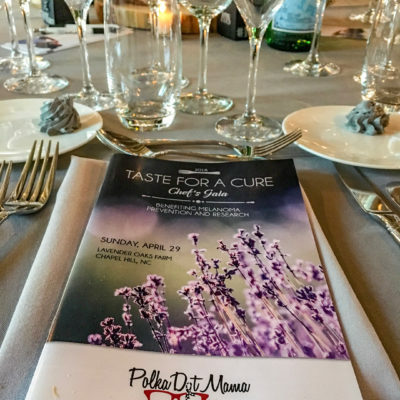 The 2019 menu will tempt your taste buds, including a raw oyster bar, shucked tableside! Beverages will be provided by Social House Vodka, Lassiter’s Distillery, Veuve Cliquot, and Whiskey Kitchen, which will be paired with each appetizer for a perfect match. Serge Falcoz-Viegne of Saint Jacques is returning as our Executive Chef, overseeing 15 different dishes and the multiple chefs who will create them. 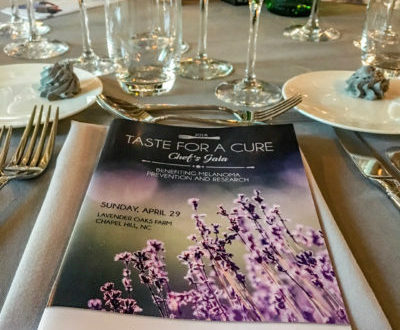 The appetizers will be served directly by the culinary experts, allowing you to learn about the flavor inspirations from the food artists themselves. Dinner will be family style, so bring an appetite! After the meal, we will have multiple desert choices and dancing, a new addition for 2019. Check your email in coming weeks for a link to help us select the songs. In addition to the amazing food and drink, there will be a silent auction with over 100 items up for bid, accompanied by a live auction which includes a NASCAR driving experience. Transportation will be provided from the gala hotel (AC Hotels by Marriott at North Hills) to The Pavilion at Carriage Farm to allow everyone to be safe and have fun. The event planners at Forward Fig have covered every large and small detail, ensuring this will be the best event yet! If you’re drooling for the chance to try the amazing dishes that will be prepared, click here for all the additional details. We look forward to welcoming you on April 28th.